There are currently three main companies offering rentable ‘patinete elétrico’ (electric scooters) that are available to pick up from the street: Grin, Yellow and Tembici. 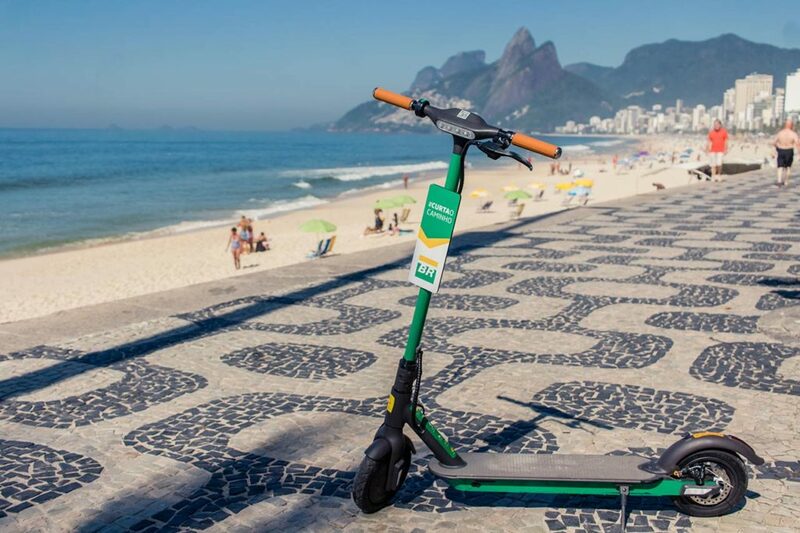 RIO DE JANEIRO, BRAZIL – Anyone walking around the streets of the ‘Cidade Maravilhosa’ can’t help but notice the mysterious presence of ‘patinete elétrico’ (electric scooters) intermittently dispersed outside hotels, shops and street corners. Rentable electric scooters are the new craze to hit Rio, and so here is a guide to the different types available, and how to use them. The company with the most visible scooters around the city are Grin, who boast 100,000 users and are planning to bring 12,000 scooters to the streets of Brazil, photo internet reproduction. The biggest company currently operating in Rio is Grin. They are a Mexican company who have also put scooters on the streets of São Paulo, Belo Horizonte, Porto Alegre, Curitiba and Florianópolis. The scooters can be found all around the city, as well as at certain partner stores and outlets. They can be unlocked using the Grin app, which then allows for an initial free ride of ten minutes. 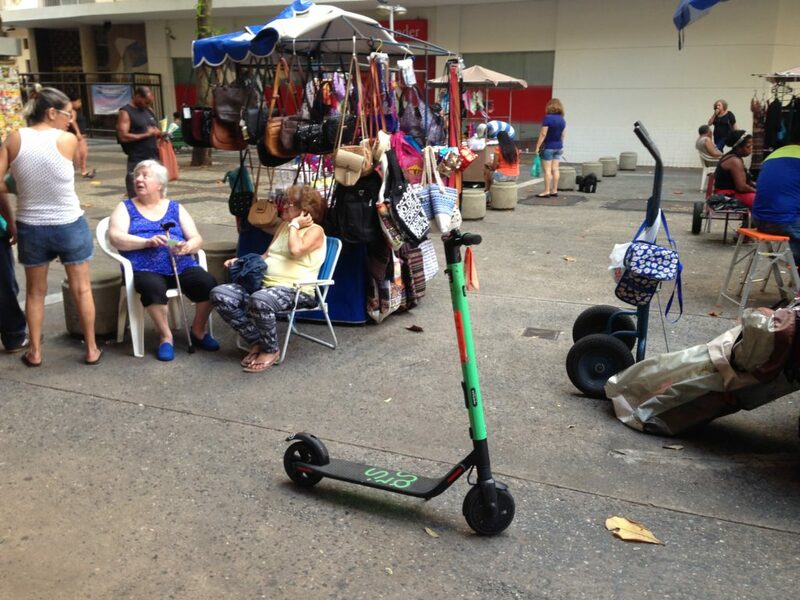 The scooter can then be accessed for a fee of R$3, which covers the first three minutes ride, followed by 50 centavos for each additional minute. These scooters can reach a speed of up to 20kph (around 12.5 mph) but riders must keep to below 6kph (3.75mph) when riding on pavements or other pedestrian areas, according to Brazilian law. “I’ve seen lots of people have accidents with them. But I can imagine it’s super fun if you don’t break anything!” comments Belgian traveler Dounya Vandamme. “Lots of people just go way too fast and too confident and then there is a little hole on the badly-maintained road and they fall super dramatically.” She concludes. Although accidents so far have not discouraged people from picking up one of these new scooters, their potential dangers should be taken into account. Yellow are one of the main competitors to Grin, and they also have a semi-dockless approach which means that riders can pick up and drop off scooters all over the city. After downloading the app, the initial unlocking fee is R$2,25 with an additional 75 centavos after each minute of use. Tembici offer a similar service to their competitors but with official docks where riders must pick up and drop off their scooters, photo internet reproduction. Finally, there is Tembici, who offer a scooter service in partnership with Petrobras. They have a fleet of docked scooters across the city, where riders must take out and return their electric scooter from a designated station. Tembici have stations in Copacabana, Lagoa, and Leblon, among other places. The cost is R$4 for every 15 minutes and the docking stations are open from 8AM until 8PM. The Tembici scooters’ speed are also limited to 15kph (9 mph) in order to ensure the safety of the rider and pedestrians. Unlike the Scoo scooter company in São Paulo, which offers helmets, none of these scooters come with protective headgear. And though it is not illegal to ride an electric scooter without a helmet, ‘O Departamento Nacional de Trânsito’ (The National Department of Transport -Denatran) strongly advise against it.